Well it’s over, it’s done, the dust has settled, and I slept for like 12 hours afterwards! So I am sitting here thinking over my performance as both a competitor and also as a tournament organiser, I have come to the conclusion that both is not a great idea. So to start off the night before the tournament I worked a 12 hour shift at work with almost two hours travel each way on top. This is not recommended and attributed directly to my rather appaling attitude and performance when I played Battlehammers Spooney (who didn’t win the wooden spoon this time), for that I apologise. So tournament organiser self critique first, I was on time ready and raring to go, I had my shirt on all the names in Tie Break a few spelling errors to correct, and a few teams to register, bang done nice and smooth, the store staff helped set the tables up Battlehammers got there terrain set up, it was a good start, personally the actual start could have gone smoother in had players at their tables earlier but other than that went well, first round had obviously first kill and goal, and this is where things slid, I was playing (odd number of players otherwise) so these didn’t get entered until later, not a problem, first results in and made a bit off a mistake which I didn’t find out till end off round two. On Tie Break you enter the scores and select the winner, so some of the round two pairings may have seemed a bit harsh at the time but no one really noticed (I hope). After that other than a slight hiccup where instead off redrawing a round I created a new one it went well until the end. Another problem is people asking rules questions, whilst I am trying template a game and the stop watch is running, it throws your thinking, but it’s something you have to do, and with the mass off crazy combinations and character plays you can pull off its not surprising I had to field a few questions, and No you can’t charge an engaged player, as funny as it may be. My last and final mistake, as well as the dearest was in an effort to finish up, I asked if a game could be called as I didn’t see it affecting the top three, all players were happy with it, I did the top three certificates, tidied up and, yes the third place competitor had changed, dam I felt bad, followed by a quick exchange with the store boss, handing my credit card over and buying another starter set. Facepalm moment as I had been intending on buying myself another starter. Needless to say I won’t be doing that again in a hurry. Overall I don’t think I did to badly, a bit more prep more players earlier on the tie break system would have made things a bit smoother but oh well I know for next time. 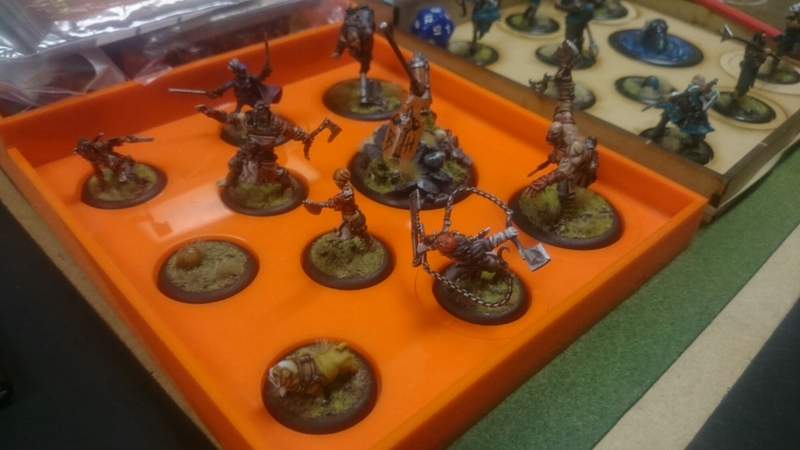 I took my 75% painted Union with me and as I wasn’t expecting to play hadn’t really thought about a team, my first game was literally grab some models and throw them on a table, luckily my ‘core team’ never changes I always run Minx and Snakeskin, so just two more to grab, Gutter and Fangtooth, Gutter I have used before, doesn’t tend to do to badly on the whole but really never unlocked her full potential, and Fangtooth, never used before and in all honesty never really used on the day either. 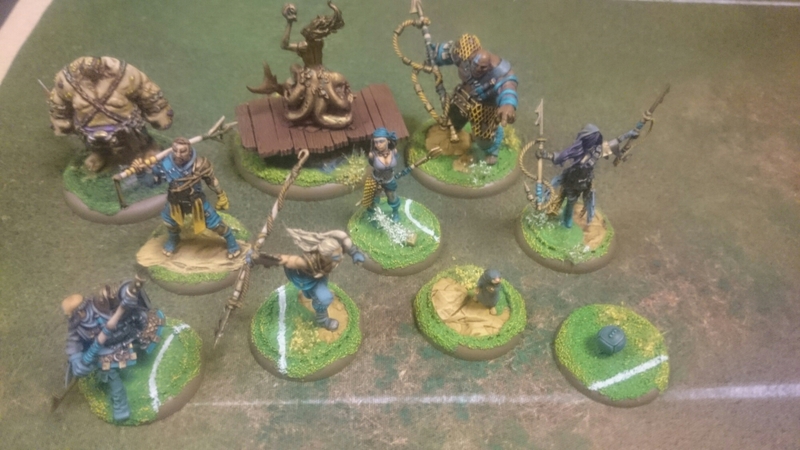 My first game, Straw off the Battlehammer, the guy who when I beat him last time I gained Third at the Winter Open, who ever since we have had a bit off a friendly rivalry going, and today was my first game, looking at my team, and knowing just how much experience he had really filled my soul with a deep sense off dread. I won, unbelievably I beat him, not the solid sound thrashing I would have liked considering the amount of times I have heard ‘dirty, cheating Union’ but a first game win I will take that, the final score was 12-10 to me so really you couldn’t get a much closer game, and it was the kind off game that could have gone either way, it’s just this time, it went my way, and was such a fun game as well, I was trying to describe the game to an interested person, but after three apologies and seeing me and Straw getting drawn further into the epic confrontation he went to look for a less intense game to watch. My second game was against Parker another of the Battlehammer crew, I was beginning to smell a conspiracy already, Parker was rolling with the Butchers so was hoping to out football him, I think it worked but somewhere along the lines the wheels started coming off, the end score was 6-12 I don’t think it was to bad a game, but I was staying to tire and get frustrated, (did I mention the 12 hour shift I did the night before) this is where it started to tell, Parker took me to the wire punished my mistakes and soundly beat me, I don’t feel to bad about it know after all he won the whole tournament anyway. Lunch was quickly followed by round three all the hiccups gone I was raring to go, afterglow I was facing Battlehammers (conspiracy???) Chris ‘Spoon’ Andrews the winner off the first Spoon at Athenas Winter Open, and his Engineers, OK this will be new for me never even seen the engineers on any table and a quick think of what I remembered of engineers led to me remembering, nothing. A quick recap now off engineers would be get the ball keep it away from them and score, what’s with the bows, hit push back and knock down, and they call the Union dirty, needless to say after the 20th knockdown had been placed on my player, I was beginning to have a sense of humour failure, although I did get my own back by pointing out he can’t charge an engaged model! It’s in the rules I didn’t just make it up to spite him. This was the game I felt bad about because after a few rounds I just knew nothing was going to come from it, and started to think going to sleep might be a wonderful idea, so Chris won, he deserved to win even with his cheating tricks, but I still could have given it more, he probably would have won anyway, but he deserved a better game than I gave him. 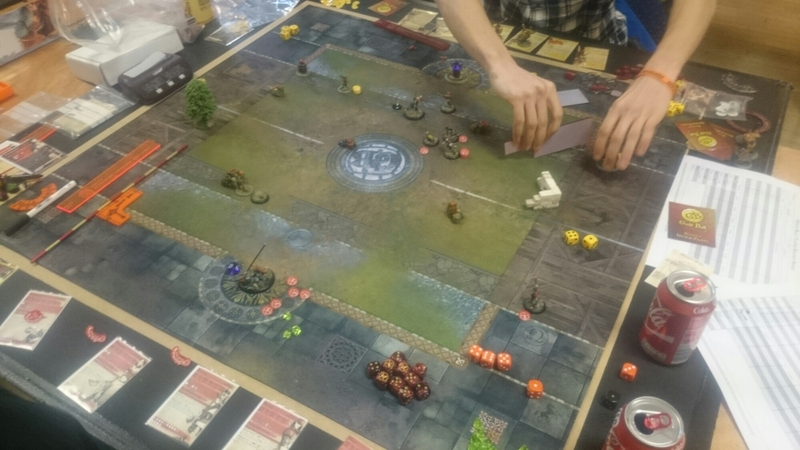 Final Game of the day for me was against David Gilbey and his Butchers, a little groan may have escaped my lips but at least I wasn’t playing the final player from Battlehammer! 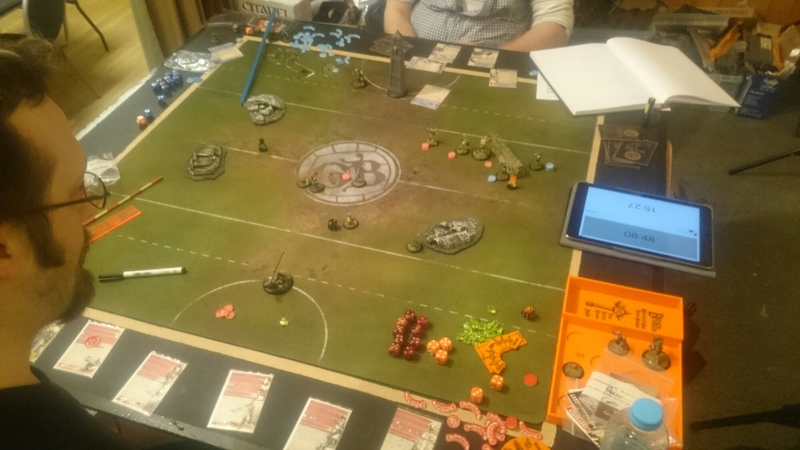 Starting the game I knew 1st was way off stupid goal but a good middle table spot was still on the cards for me, so after a break and a tin of popular energy drink I was ready. The game was almost a complete U-turn from the previous two, afore mentioned beverage and a bit of a snack, had sharpened my senses and after two performances I wasn’t happy with I was out for blood. From a Butcher, only just noticed the irony off that. Regardless Dave did with his Butchers what Butchers are good at, hurting things, Harry the Hat was just a sacrificial momentum generator for me, him Minx and Gutter managed to tie up most threats for a good amount off the game and despite having three players took out they were able to get back up quickly and take out a few players as well, which allowed Snakeskin to engage Princess kill her off and then move and take the shot that cemented me mid table and win the game. Tenth Place was mine out of 18, not bad considering the week from hell I had just endured, hopefully there will be more pictured to follow and maybe even a video of me chatting to Straw, who mysteriously starts using a foreign accent! One awesome game to solid games where I could have done better and a game I would rather soon forget. One thing I hope going into the summer open is that I can practice more before, and that I don’t have to play, that and I want 32 players. 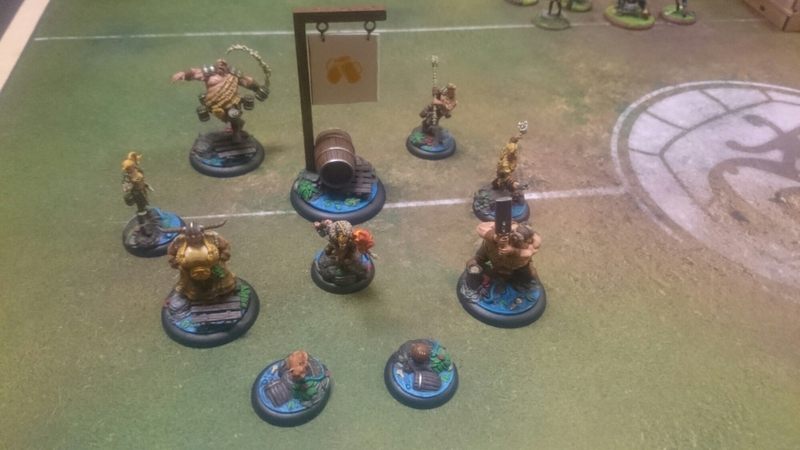 16 games of Guild Ball at the same time.